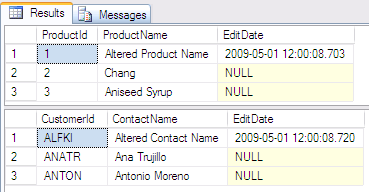 You have a lot of tables in your database with columns such as EditDate and UpdateByUserId and you're using Linq as your data access method. Instead of updating these columns all over the place in your code, you want a centralized solution to make sure that these columns are updated whenever an entity is changed. Disclaimer: This is what I've come up with, please comment on it should you see any problems with it. This article will assume experience with working with Linq and object oriented programming. To keep this example lean and simple we will have only one common column between our entities. I will use the Northwind database, however I have edited the Customers and Products table, adding an EditDate column of type datetime. But I don’t really like this solution since this would require me to do this whenever I’ve changed something in the Customer table and regenerates this class… It seems to me that leaving the .dbml file (and it’s designer.cs code behind) as is is more maintainable. This is also the reason why I inherit from my Entity superclass in partial class definitions (of Product and Customer) instead of editing the Northwind.designer.cs file directly. This is possible thanks to the fact that the Linq generated classes are declared as partial. And this actually compiles just fine. As you can see, my partial class definitions does not implement the EditDate property, but the partial classes in the designer.cs file does. I don’t know any programmatic way of enforcing the combination of class inheritance with a specific interface, so as you can see above I use the default constructor to check if the current object (this) is an IEntity. If not the exception message will hopefully give the developer running this code some hint on what to do. With this validation in place, the Entity will now be able to access members through the IEntity interface. First of all I have added a private class member of type IEntity, this is assigned in the constructor and now I can easily access all the members of the IEntity interface (which actually will run code in the generated designer.cs-file!). 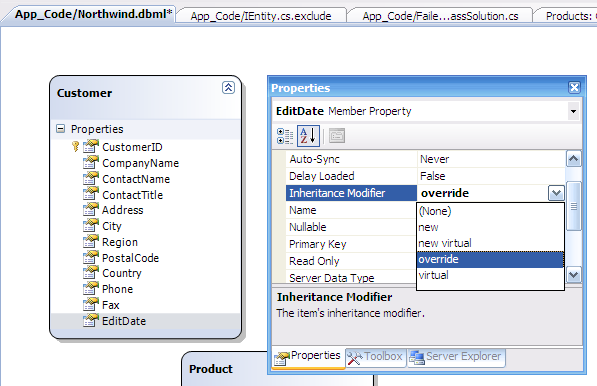 To achieve my goal I hook up a method to the PropertyChanged event and in that method i update the EditDate property. The PropertyName property and the PropertyChangedEventArgs gives me the name of the property that got changed causing the PropertyChanged event to trigger. By checking that this isn’t equal to “EditDate” I can update the value of EditDate. This will cause the event to trigger again, but this time e.PropertyName will have the value of “EditDate” so the if statement will be skipped. Should you add code that also updates an UpdatedByUserId field, this too has to be checked in the if statement. 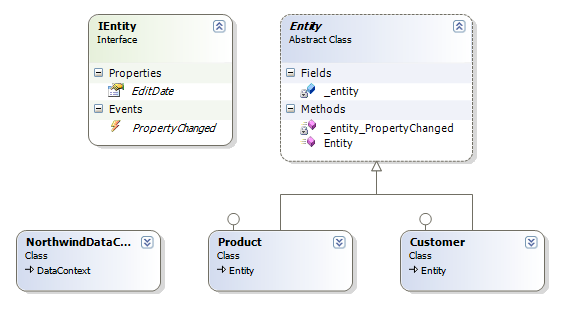 The three bottom classes are the ones generated from the .dbml file, remember though that the Product and Customer class are complemented with partial class definitions that makes them inherit from Entity and implement IEntity.